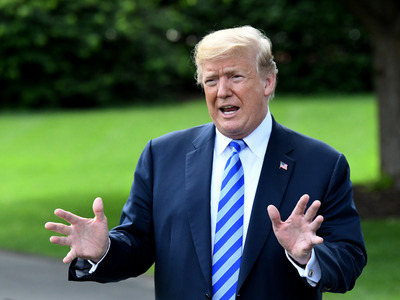 Getty ImagesPresident Donald Trump on Monday argued on Twitter that he could pardon himself. President Donald Trump said on Monday morning that he had the right to pardon himself. Over the weekend, his lead lawyer, Rudy Giuliani, also said Trump had the right to give himself a pardon but would not use it. Trump last week proposed pardons for people convicted of offenses similar to those for which his campaign is being investigated. Trump also claimed Robert Mueller’s appointment as special counsel was unconstitutional. In a series of tweets Monday morning, President Donald Trump asserted that he had the “absolute right” to pardon himself and that the special counsel’s investigation into his campaign violated the US Constitution. Trump’s claim that Robert Mueller’s appointment as special counsel in the Russia investigation was unconstitutional is undermined by a ruling last month in a lawsuit filed by the former Trump campaign chairman Paul Manafort in US district court in Washington, DC. The suit, filed against the Department of Justice, sought to narrow the scope of the Mueller investigation and rein in his jurisdiction. District Judge Amy Berman Jackson dismissed the lawsuit and upheld the legality and scope of the investigation. In an interview with ABC’s George Stephanopoulos on Sunday, Trump’s lead attorney, Rudy Giuliani, said Trump “probably” had the power to pardon himself but had “no intention” of doing so. On Thursday, Trump stunned much of the political world by announcing a presidential pardon for the conservative commentator Dinesh D’Souza and floating the possibility of pardons for the television personality Martha Stewart and the former Gov. Rod Blagojevich of Illinois. The three were convicted on offenses related to campaign-finance violations, obstruction of justice, and corruption. Some interpreted these actions as a signal that Trump would move to pardon anyone implicated in Mueller’s investigation, including, potentially, himself. A 20-page memo sent to Mueller by Trump’s attorneys John Dowd and Jay Sekulow in January and published in full by The New York Times last week argues that Trump cannot be guilty of obstruction of justice because he has full jurisdiction over all federal investigations. The question of whether a president can pardon himself has never been tested in a court of law, but legal experts are divided as to whether it would be upheld.